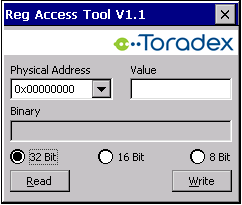 The Reg Access Tool or Register Access Tool is a free tool which allows you to read from and write to physical addresses such as registers, RAM locations, etc. on Colibri and Apalis computer on modules. Previously we had this functionality as a part of our Colibri Tweak tool but for better maintainability we have split this into a separate tool. Allows you to read and write memory/registers in 8Bit / 16Bit / 32Bit format. Provides binary values of the output, for easy readability. Drop-down keeps the history of used addresses. You can copy binary data using Ctrl + c.
Added Command Prompt interface for read and write memory/registers in all formats. Added Command Prompt interface for Clear and Set mask of memory/registers in all formats. Note - Reading from or writing to wrong/critical memory locations and registers can lead to the tool or even system freezes and crashes. Please make sure you know which addresses you are accessing. Please refer to the individual SoC (processor) datasheet for details about the memory map and register descriptions. Reading address 0x0000000, assuming application placed in FlashDisk directory. Reading address 0x6000d008 in 8bit format, assuming application placed in USB HD directory. Writing value 0xFFFF at address 0x0000000 in 16bit format, assuming application placed in USB HD directory. Clear and Setting mask at address 0x81000000 in 32bit format, assuming application places in USB HD directory.